Among the Knights of the Old Republic fanbase, one of the most outstanding lines of dialogue happens when the player is on Korriban and is exploring the Tomb of the ancient sith lord, Ludo Kressh. The player enters the tomb alone, but eventually encounters what appears to be Kreia, along with the rest of player’s party members. It’s an awfully convincing argument. You have the power to do something about this situation and instead you’re just gonna stand there. You take up space and you consume resources, but produce nothing. You’re just like Darth Nihilus, you destroy but you don’t create. You’re guilty of the sin of sloth. That’s one interpretation of it at least. Many discussions on Kreia eventually lead to this scene being brought up. But no matter how you interpret Kreia’s words, there’s only one problem. This is not Kreia. The biggest giveaway is the fact that she refers to your party members by name. She always calls Bao-Dur “The Alien” and Atton “The Fool”. She’s also carrying a default blue lightsaber, even though she appears to be on the dark side, and as Darth Traya she carries a red lightsaber plus three purple lightsabers. But most importantly remember that Kreia wouldn’t set foot on Korriban. She’s back on the ship. You’re on Korriban, but more specifically you’re inside the Tomb of Ludo Kressh. Korriban radiates dark side energy, but it’s even more potent inside the Tombs. The dark side is always trying to sway you over to its side. I imagine a location that radiates with the light side of the force would try to do the same. Both could be considered corruption. But the methods they would use would differ. The dark side wants to break you violently, and if it fails, it kills you. The “Kreia” that we encounter is a manifestation of the Tomb of Ludo Kressh and so is all your companions. The game gives you the option to recognize this and say that this is just another trick. When everyone shows up and array themselves against Kreia, you’re given the option to either help Kreia, help your friends, or do nothing. If you choose to do nothing, the Tomb attempts to influence you and it does so in a particularly clever way. But can you really say the Exile is being apathetic in this scene if she does nothing? She recognized that what’s happening isn’t real. We should take notice of what happens if you do decide to do something. If you side with Kreia under the guise of “anyone can and should be redeemed back into the light”, you receive light side points. If you side with your ‘friends’ and kill Kreia under the guise of: “You’ve been manipulating me, you dark side witch, it’s about time I end you” and you strike her down in anger, you receive dark side points. The force itself wouldn’t care whether you receive light or dark side points. But the whole point of this Tomb is for you to receive those dark side points. These dark and light side scales are tilted due to someone’s state of mind. Kreia meditated to center herself, she needed to keep her mind in balance. Before facing Darth Nihilus, Visas Marr meditates in her former chambers. She says that what she’s about to do will not be done due to hate or revenge. She did what she did, not because Nihilus killed her people and then made her slave. She came to terms with what happened, and now she will stop Nihilus for the preservation of life. That was her mind set. Like I mentioned before, Kreia refused to set foot on Korriban. Because it’s difficult for her to remained centered there. If you had traveled to a planet that was a force nexus for the light side of the force, she wouldn’t set foot on that either. No matter which side you fall into, you open yourself up to the force. If the Exile wasn’t a wound in the force, choosing a side in this situation would have been more harmful than doing nothing. So if you think about the situation, you’ll realize that it’s a trick. You’ll see that there’s nothing to gain by picking a side and instead there might be more to lose. So the Exile consciously decided that the best course of action, in this instance, was to do nothing. There’s a difference between apathy and choosing to do nothing. In Kreia’s Conundrums - Charity, I spoke about giving money to impoverished people. If I had decided not to give them anything, than that would have been my choice and I would have a reason as to why I didn’t. It may not even be a very good reason, but it was a reason nonetheless. If I had walked past them and they’re existence barely registered with me or I just say “whatever, it doesn’t matter” THAT would be apathy. Like force alignment, the dichotomy between apathy and purposeful inaction comes down to a person’s state of mind. It instills doubt. It can make you go: “Hm, you have a point. Maybe I really should have done something, anything.” It instills regret. You don’t get a second chance, you’ve already made the decision. By the end of this entire trial the Exile can tell Kreia that she doesn’t think that this experience will change her for the better. Experiences with the dark side don’t have to change you right away after all, only nudge you down the path. It can influence decisions you make in the future. You may find yourself in another situation where doing nothing may be the best course of action. But this experience may make you doubt that, and you could end up deciding to do something or picking a side and you end up causing more harm. 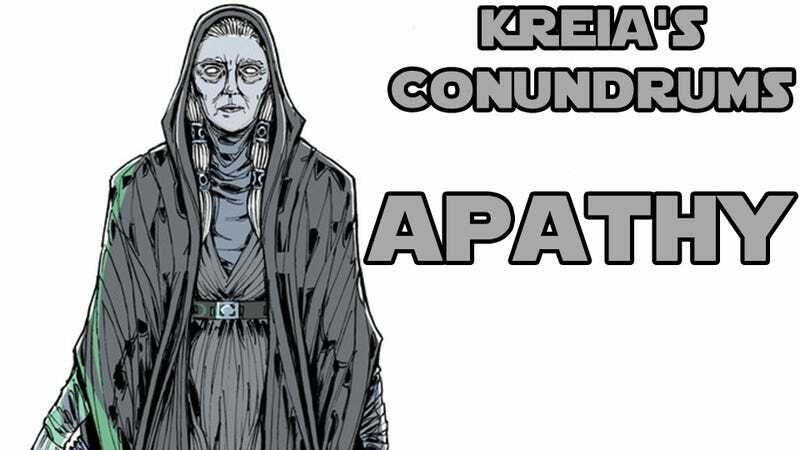 But Kreia suggested that the Exile go through this experience because it is valuable. It teaches the Exile to be mindful of situations, to think things through. This can be applied to real life as well. In which case you can get some advice if you need to, and when you make a decision, even if the decision is to abstain, don’t second guess yourself. If it turns out you made a mistake, then learn from it. All of what the Exile experiences in the Tomb also gave her perspective on things. In the first section with the specter of Malak, she can show that she’s stuck to her principles and doesn’t regret joining the mandalorian wars. Even though the second section tells her that perhaps mistakes were made. Maybe things could have gone differently, but what’s done is done. You can admit that perhaps you made a mistake, but dwelling on it isn’t going to help you or anyone. Learn what you can from it and move on. In the third section with the specters of Kreia and her allies, she learns that she needs to be ready to put herself first, but within reason of course. No extremes of only caring about herself or only caring about others. The final section with the specters of Revan and her possible, alternate, self, teaches her to let go of her past and face the future.